Mix 1 serving (1 scoops) with 8 oz. of water and consume. Do not exceed 4 serving(s) in a 24-hour period. Drink 8 to 10 glasses of water daily for general good health. Read entire label before use and follow directions. Do not use if pregnant or nursing. Consult a medical doctor if you are using any medications or before starting a diet or exercise program. Do not use if packaging has been tampered with. 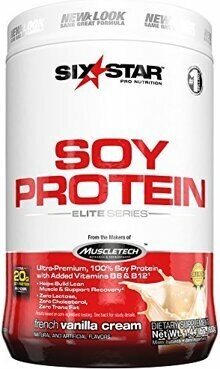 Six Star Soy Protein delivers 100% soy protein as the only protein source. Soy is an excellent vegetarian protein source that provides a complete spectrum of amino acids. This includes the essential amino acids that your body can’t produce on its own and needs to take in from external sources. Plus, Six Star Soy Protein delivers 4g of fiber and is rich in vitamins B6 and B12 to support metabolic energy. Six Star Soy Protein is perfect for anyone looking to add more quality protein to their active lifestyle. Whether you’re in the gym, in the game or just trying to meet the challenges of your busy life, stronger muscles will help you perform better. Each serving mixes easily with a spoon or in a shaker cup, and delivers melt-in-your-mouth, supremely delectable flavor that you’re sure to love! Get yours today!